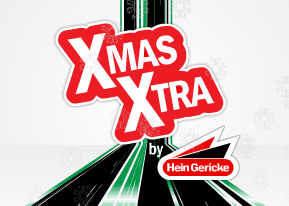 As part of their online Christmas campaign, Hein Gericke required a punchy - yet clean and easy to understand MPU and leaderboard creating. The brief set was to come up with a way of informing the audience about their fantastic gift card offer. Buy a £50 card and get an extra £10 free or buy a £100 card and get £20 extra free. I like to think the end result provides the target audience with an energetic and informative creative. This was featured on MCN during the build up to Christmas.